There are two options to store images when you import products in your store – to leave images on AliExpress or upload them to your server. Generally, it is recommended that images should be left on AliExpress and only links are obtained. In this case you can save space on your hosting and reduce loading of your server. However, some AliExpress product images may come from http://, rather than https://. This can result in SSL Mixed Content warnings shown to your customers which means that your website is not 100% secure. Moreover, you will not be able to change URLs of images you have not uploaded to your server, so they will still be linked to AliExpress. 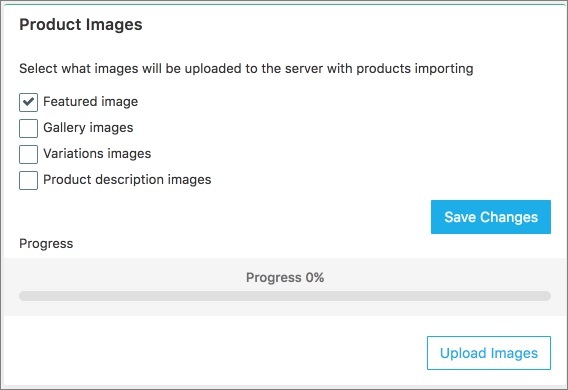 If you want to upload images and store them on the server, you can use product images importing feature. Please check your hosting capacity before uploading pictures to your server. To adjust your settings, go to AliDropship => AliExpress => Settings => Product Images. Select what product images you want to upload and click Save Changes. When you start importing new products into your store, the selected images will be saved on your hosting server. If you want to upload images for the products you have imported before, click Upload Images.